On the morning of June 29, Jen and I (former owners Rick and Jen) welcomed a group of friends loosely associated with Denison University in Ohio. 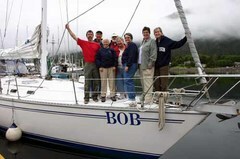 Bob and Barbara organized the trip and were joined by their friends Bill and Julia, Marci, and Joan. We met at New Thomsen Harbor’s loading zone in Sitka for a leisurely briefing and a last minute shopping spree before heading out of the harbor as the sun melted away the fog. The wind was light as we motored through the flat calm waters of narrow and protected Olga and Neva Straits. Several bald eagles stood sentry in the trees along the placid waterway, and when the sun broke out all hands headed out on deck to enjoy the scenery. A lunch of halibut chowder and freshly baked sourdough bread accompanied the sights as we powered along. Three hours after leaving the dock we slowed the boat down to trolling speed behind Sinitsin Island. Because the swell from the Gulf of Alaska was rolling into Salisbury Sound we stayed in the lee of the island, in flat water. Over the next hour we caught three King salmon, keeping one for dinner, then negotiated the narrow winding entrance to Kalinin Bay, our anchorage for the night. The snow-capped mountaintops were mirrored in the flat calm waters of the bay as the sporadic cry of eagles filled the air. An occasional sea otter swam by the boat, cracking a clam on the rock it held on its belly. 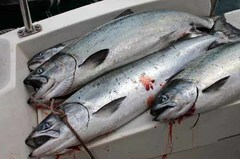 With appetites whetted by the wildlife and beautiful scenery around us, we fired up the barbeque for a fresh king salmon dinner. An early breakfast fortified us for a hike through the estuary at the head of Kalinin Bay and exploring the forest on the Sea Lion Cove trail. Several Sitka Blacktail deer were feeding on the far side of the stream. We did not encounter any brown bear on the hike, but there was plenty of fresh bear sign along the trail. Our objective for the day was to travel through Peril Strait. Since we had to pass right by Sinitsin Island, we again slowed down to troll for a few more King salmon. We barely had the lines in the water before two salmon hit at the same time and the frenzy was on, with Bob flying to one pole and Marci racing for the fish on the opposite side! Both kings were landed after spectacular battles, and as soon as we got the lines back in we had another double hit with Bill and Joan reeling in the next pair of beautiful, bright fish. With fishing gear stowed, we accelerated to cruising speed to make the flood tide in Sergius Narrows near the entrance to Peril Strait. Most people assume that Peril Strait is so named because of the narrow, winding passages filled with rocks and surging currents. The name actually commemorates a group of Aleut Indians who, on a sea otter hunting trip, harvested mussels from a small bay (currently named Poison Cove). 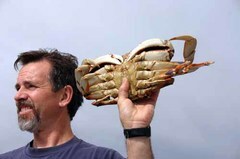 Two hundred of them died from paralytic shellfish poisoning (a.k.a. Red Tide); the long beach where they camped that night is called Dead Man’s Reach, most likely transposed from Dead Man’s Beach. Our group consensus was to continue moving until we found a secure anchorage that night in Moses Bay, a name a little less unsettling in concept! After breakfast we motored to Hanus Bay to hike the Lake Eva trail. 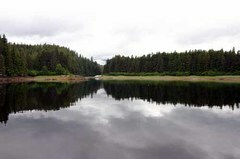 This is a beautiful trail that passes through mature spruce and hemlock rain forest, a tidal lagoon, a small waterfall, a beautiful outflow stream and finally Lake Eva itself—all this in an hour’s relatively flat and easy hike. Bill and Bob opted to fly-fish at the top of the falls to see if any of the numerous salmon or trout in the stream had eaten their breakfast yet (they hadn’t!) while the others continued on to the lake. After all hands were back on the boat we hoisted anchor and the Bob headed out of Peril Strait and into Chatham Strait. Lunch was again served under way during the four-hour run to Baranof Warm Springs. Baranof was a small town in the early 1900s and is now a bustling community of summer cabins and boating activity centered on its 250-foot state float. The bay has an incredible waterfall, trails to nearby lakes, a protected salt chuck, a beautiful natural hotsprings bordering the roaring river, and a community bathhouse along the boardwalk. We spent a pleasant evening at the dock and even shared our fresh sushi dinner with some of the neighboring boats. The group split up for a morning of hiking, hotspringing, berry picking, and visiting with residents and boaters. Everyone was having so much fun, our planned noon departure slipped to 3 PM. The drizzle started as we left the dock; we raised the sails as we motored out of the bay. 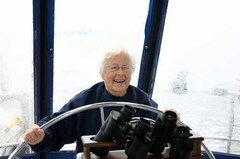 There was a nice southerly breeze in Chatham Strait and everyone took a turn at the wheel as we broad reached over to Admiralty Island. The off-watch played bridge and kept an eye out for whales and porpoise as we sailed into Chaik Bay on Admiralty Island for our evening’s anchorage. 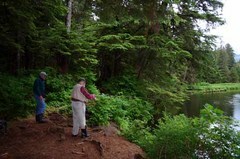 Admiralty Island has the highest density of brown bears in the world. We departed Chaik Bay early; the wind was still blowing and we wanted to take advantage of it. As soon as the breakfast dishes were stowed, we raised the sails and we were again reaching up Chatham Strait in a brisk easterly wind for Tenakee Inlet. As we approached the small town of Tenakee Springs (population 100) we dropped our crab pots off near the Indian River. Sailing past town, there was an eruption of motion to the starboard side of the boat—a group of humpback whales lunged out of the water in unison, gulping schools of candlefish with gaping jaws, then resumed spouting, milling around, and sounding one by one. We rolled the jib up (we had already dropped the mainsail when we set the crab pots) and drifted with the tide and wind for an hour, watching the whales feed. Bubble netting is a group feeding activity where humpback whales work together to create a cylinder, or “net” of bubbles in the water, which traps a school of feed. The fish or krill will not pass through this wall of bubbles and is forced to the surface; this concentrates the feed, through which the whales lunge, scooping up as much as they can in their massive mouths. Although the whales continued to bubble net it was getting late, so we reluctantly rolled out the jib and sailed across the inlet to anchor in Saltery Cove for the night. 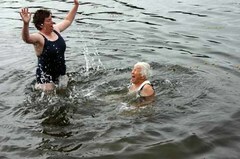 Tenakee Springs is known for its small town feel with its big Fourth of July Celebration. We raised the anchor and motored back across the inlet to participate in the festivities reminiscent of simpler days fifty years ago. Our first stop was a quick pull of the crabpots yielding a nice catch of Dungeness Crabs. The whales were nowhere to be seen today as we dropped the anchor in front of town. The celebration kicked off with Tenakee’s World Famous Two-Minute Parade. Homemade floats pulled by four- wheelers or wagons followed the town’s only fire truck down the only dirt road (actually a pedestrian right of way) in Tenakee. Assorted residents, kids and visitors followed behind the floats on foot, on bikes and skateboards, and on just about anything else you can think of, all decked out in festive homemade costumes. The big parade was followed by a community potluck with all the king crab, shrimp, hot dogs, potato salad, and dessert you can eat. The residents eat the hot dogs and potato salad, while visitors divulge their status with cries of delight over the crap and shrimp. Although we were dragging a bit from stuffing our faces and all the excitement of the festivities, the best was yet to come: foot races, bike races, slow-bike races, three-legged races, piñata bashing, log sawing, balloon tosses, egg tosses and other games of chance and skill. Of course all of this gaiety was in addition to the usual activities in Tenakee of soaking in the community bath house, fed by the natural hot springs, and hiking down to the Indian River to look for pink salmon in the stream, and the brown bears that come to feed on them. When we could take no more, we dragged ourselves back to the boat and talked about the events of the day while we struggled to stay awake until dark for the fireworks display. All in all it was a memorable day, taking us not only on an Alaskan adventure but seemingly back to an earlier time. No one was quite ready to leave Tenakee, so we all grabbed a quick breakfast and split up to do our own things in town—hiking, shopping, soaking in the hot springs, and just wandering around. When everyone returned to the boat, we headed out of the inlet. The crabpots were full again, but we only kept a few of the biggest and released the rest, since we hadn’t had time (or room!) to eat any of yesterday’s crabs. Our destination was just a few hours away, Pavlof Harbor in White Water Bay. 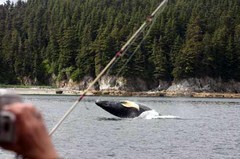 As we passed East Point on our way into Whitewater Bay, we sighted a large dorsal fin in the water ahead of us. A few seconds later it rose again and we could see it was a large male Orca accompanied by two smaller whales. 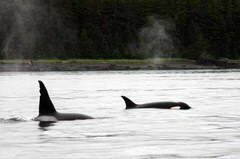 As we passed the orca, they turned and ran alongside us for a few spouts, then slowly moved away. 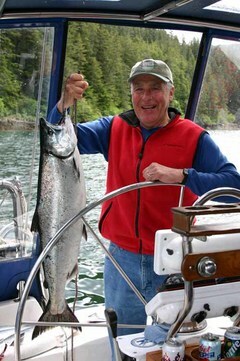 An hour later the anchor rolled off the bow in Pavlof harbor and a feast of fresh Dungeness Crabs was soon on the table! Marci had declared herself our bear watchperson and her morning vigilance finally paid off as she spotted a brown bear working its way around the beach. Everyone clambered out on deck and watched as the bear meandered along the shore. Breaching As often happens, our plans for the day’s activities can change depending on what we find as we turn a corner. 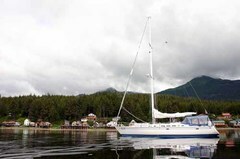 Our original plan for the day was to sail up Chatham Strait towards Juneau and do a little halibut fishing in Icy Strait. 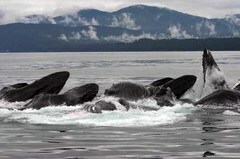 Instead, as we turned the corner outside of the harbor, we ran across a large group of humpback whales bubblenetting. Again and again the whales lunged halfway out of the water with their mouths open, scooping up candlefish as the gulls swooped in to try to steal a few. The pattern seemed endless—whales would erupt out of the water, settle back down, spout a few times, then sound (dive deeply showing their tail flukes), and all would be quiet for a few minutes until they appeared again. We watched, we listened, and we smelled—with our noses, that is. There’s nothing like the smell of old fish stuck in whale baleen! After an hour or so of incredible whale watching, those of us with short attention spans found additional stimulation by picking up fishing poles and jigging for halibut as we drifted with the whales. Soon, rockfish, pacific cod, and halibut were hitting almost everything we put in front of them. We kept a few halibut to eat and released the rest. The whales continued to feed in the area, and one young whale put on a breaching show for us, coming closer and closer to the boat until on his last breach he actually made eye contact with Marci and splashed the bow as he crashed back into the water. Of course this was just after Marci’s camera battery went dead and Jen’s memory card filled up! We accepted the breaching act as a grand finale and started north in Chatham Strait. Chatham was glassy calm and the crew began a bridge game as we motored along. An hour into our journey, we ran across another group of humpbacks bubblenetting near Pt. Augusta. The cards were abandoned as everyone again headed out to the deck for another whale show. It was getting late, though, and the whales were heading opposite of our direction, so we only watched briefly, then continued on for Whitestone Harbor, which provided a nice anchorage for our evening and dinner of fresh baked halibut. A pair of bald eagles provided our breakfast entertainment, but they were soon upstaged by Marci and Julia. The conversation went somewhat along the lines of, “The water doesn’t look that cold.” “I think I want to go swimming.” “I’ll go if you go.” After a quick change of clothes, I loaded Marci and Julia into the skiff and we ran to the shore before the swimmers could change their minds. 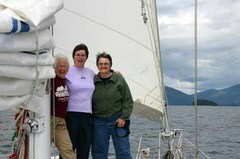 With the ladies toweled off and back aboard the Bob, we continued north up Chatham Strait towards Juneau. The breeze picked up out of the south, so we raised sail and were soon moving pleasantly along in an unusual easterly breeze, which allowed us to reach up along the Admiralty Island shore. 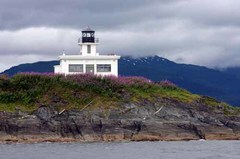 We sailed past Pt Retreat—the northernmost point of Admiralty Island—where the lighthouse was surrounded by blooming fireweed. 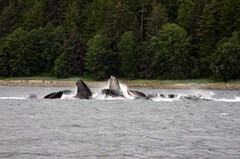 Our last night was spent in Lena Cove, north of Juneau, where we relived the experiences of the nine days. It was a little strange to see houses around us and to hear the occasional car driving down the road alongside our bay. 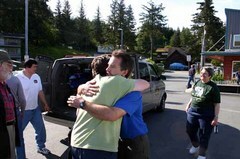 The run from the Cove to Auke Bay Harbor, north of Juneau’s airport, took an hour. The crew spent the time getting gear organized and packed, having a bite of breakfast, and mentally preparing to re-enter civilization! We arrived at the fuel dock about 8:30 and found that the wildlife show was not over yet—several eagles put on a display for us as we fueled up and headed over to the main float, where telephones, taxis, and a burger stand are all available at the top of the ramp.